Maryland Court records reflect no prior citations or criminal arrests. Maryland Transportation Authority Police Spokesman First Sgt. Jonathan Green identified Dixon as the driver in the crash on the Bay Bridge on April 2, 2016, that killed Randy Drake Thrower when the vehicle that Dixon was driving slammed into the rear of a truck that was operating in the same direction on the eastbound span. 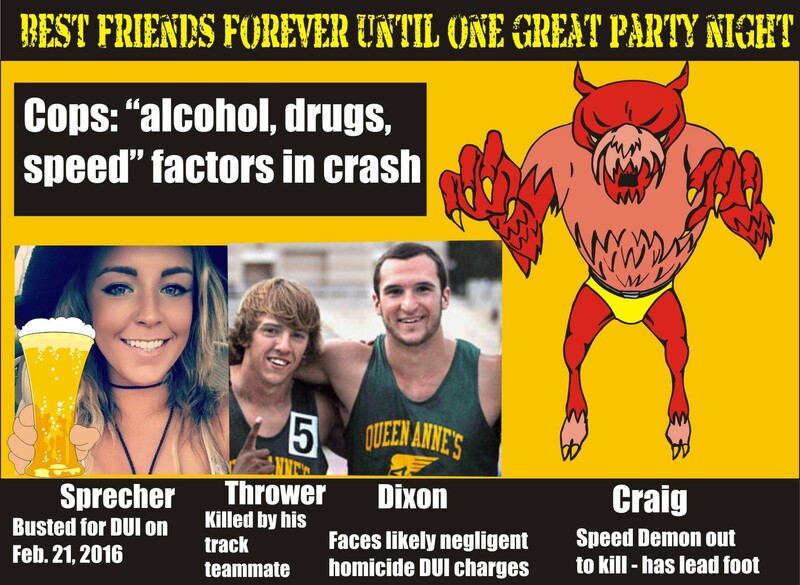 “Alcohol, drugs and speed are considered factors in the crash,” reports Green. Cited on March 24, 2015, by a Maryland State Trooper traveling at 70 mph in a 55 mph zone on Rt. 301 south of the Welcome Center and paid a $90 fine. Cited on Nov. 7, 2014, at 7:23 am for traveling at 75 mph in a 55 mph zone on Rt. 301 by Maryland State Trooper Q. Bekken; paid a $160 fine. Cited by Maryland Transportation Authority Police Officer V. Edwards for failing to control speed to avoid a collision while operating a 2014 Chevrolet on the Chesapeake Bay Bridge on Aug. 11, 2014. On Dec. 30, 2014, Craig entered a guilty plea in Anne Arundel County District Court and was fined $102.50. Cited by Queen Anne’s County Sheriff’s Deputy Parks on May 29, 2014, at 5:54 pm for operating a 2014 Chevrolet southbound on Rt. 213 at Rt. 309 at a speed of 72 mph in a 55 mph zone; she paid a fine of $17.50 in a plea deal with the Queen Anne’s County States Attorney on Aug. 1, 2014. Cited by Centreville Police Officer D. Larrimore on Oct. 18, 2013, with failing to provide a driver’s license on demand and in a plea deal with the Queen Anne’s County States Attorney on Jan. 16, 2014 was fined $50. Sprecher was cited by Maryland State Trooper S. W. Hoffman on Feb. 21, 2016 at 2:06 am, for traveling eastbound on Rt. 50 east of the Kent Narrows Bridge at 67 mph in a 55 mph zone in a 2014 Mazda; DUI, driving vehicle while under the influence of alcohol; driving with alcohol in her blood in violation of restriction; doing a forbidden act, failing to perform required act pertaining to driver’s license; Trial date for these charges are set for May 16, 2016, in Queen Anne’s County District Court. Attorney William A. Stavros of Towson, Md., has filed in court records to represent Sprecher in this trial. Sprecher was cited by Maryland State Trooper D. A. Pope for driving while using a cell phone on Rt. 301 on Dec. 15, 2015. In a plea deal in Queen Anne’s County District Court, she entered a plea of guilty and was fined $83. Sprecher was cited by Queen Anne’s County Sheriff’s Deputy Jason R. Rickard for possession of a false ID under 21 on March 30, 2014, and Queen Anne’s County States Attorney Lance Richardson put the charge on the Stet Docket on June 11, 2014. Sprecher was cited for speeding while southbound on Rt. 301 on July 6, 2015, by Maryland State Trooper Shane Mitchell; doing 71 mph in a 55 mph zone. In a plea deal on Sept. 11, 2015, with Queen Anne’s States Attorney Lance Richardson, she entered a guilty plea and paid a $55 fine. Sprecher was cited on Oct. 22, 2013, with speeding at 76 mph in a 55 mph zone while northbound in a 2013 Kia on Rt. 301 at Rt. 313 by Maryland State Trooper K. R. Morrison. In a plea deal with Kent County States Attorney on Dec. 20, 2013, she entered a plea of guilty in return for Probation Before Judgement and paid a fine of $160. Sprecher was cited numerous times for not displaying a driver’s permit to police officers. Stevensville, Md. – Maryland Transportation Authority Police reports that a twenty-one-year-old Queenstown, Md., man was killed when a sedan in which he was either the driver or a passenger crashed into the rear a truck on the eastbound span of the Chesapeake Bay Bridge, just after the magic 2:00 am killing hour of bar closings in the Annapolis area. Annapolis is located on the Western Shore of the Bay while Randy Drake Thrower, 21, is from the Eastern Shore, the direction in which the fatal crash occurred. A police spokesman said that drugs, alcohol ,and speed were all factors in the crash, which fortunately did not injure the driver of the truck — only the party crowd in the sedan. Thrower, who lived at 200 Somerset Court in Queenstown, Md., was cited by Maryland State Police Trooper D. A. Pope on Nov. 3, 2015, at 4:54 pm on Rt. 50 while westbound at Castle Marina and ticketed for driving at 73 mph in a posted 55 mph zone. Thrower entered a guilty plea in District Court for Queen Anne’s County on Jan. 5, 2016 and was fined $64.50. Thrower was charged with two counts of driving while his license was suspended on Aug. 7, 2015, by Queen Anne’s County Sheriff’s Deputy Martz while operating a 2009 Mustang while southbound on Rt. 301 at Del Rhodes Ave. in Queenstown, Md. Queen Anne’s County States Attorney Lance Richardson dropped both of the charges on Oct. 8, 2015. Maryland State Police Trooper Landis charged with Thrower with multiple counts of driving while suspended and speeding at more than twenty mph over the limit on July 2, 2015, while southbound on Rt. 10 at Furnace Branch Road in Anne Arundel County, Md. Anne Arundel County States Attorney Wes Adams dropped all of the charges on Sept. 18, 2015. Thrower was ticketed for speeding on Rt. 405 west of Rt. 301 on Oct. 22, 2013, by a Maryland trooper and he entered a guilty plea in Queen Anne’s County District Court on March 14, 2014, and was fined $90. A speeding ticket on July 8, 2013, awarded to Thrower on Rt. 301 for traveling at 74 mph in a 55 mph zone resulted in a fine of $90 in Queen Anne’s County District Court. On June 4, 2013, Thrower was cited in Talbot County by Pfc. Merrick for underage possession of alcohol; the charge was fined $195 and put on probation. A drug charge of the same date for less than 10 grams of pot was dropped by Talbot County States Attorney Scott Patterson. With numerous charges for driving while suspended dropped by prosecutors, Thrower’s luck ran out on Aug. 9, 2012, at 1:15 am when he was cited by Queen Anne’s County Deputy C. Ahern. In District Court for Queen Anne’s County on April 12, 2013, Thrower was found guilty and fined $150. A 21-year-old man from Queen Anne’s County was killed in a crash on the Bay Bridge early Saturday, police said. A 2011 Mazda sedan and a 2014 Freightliner box truck collided on the eastbound side of the Bay Bridge in Queen Anne’s County at 2:22 a.m. Saturday, according to 1st Sgt. Jonathan Green, a spokesman for the Maryland Transportation Authority police. This entry was posted in DWI Arrests by State, DWI crash photos, Hell-hole bars, Illegal drugs, injury or death, Top Cops and tagged 1st Sgt. Jonathan Green, Aimee Lynne Craig, Attorney William A. Stavros, Centreville Police Officer D. Larrimore, Chesapeake Bay Bridge, Cited by Queen Anne’s County Sheriff’s Deputy Parks, Driving Under the Influence, driving while intoxicated, drunk driving, DUI, DWI, Kent Narrows Bridge, Maryland State Police Trooper D. A. Pope, Maryland State Trooper S. W. Hoffman, Maryland State Trooper Shane Mitchell;, Maryland Transportation Authority police., Queen Anne’s County, Queen Anne’s County Deputy C. Ahern., Queen Anne’s County District Court., Queen Anne’s County Sheriff’s Deputy Jason R. Rickard, Randy Drake Thrower, Talbot County States Attorney Scott Patterson., Taylor Marie Sprecher, Tobin Joseph Dixon high speed killer faces likely DUI homicide charges. Bookmark the permalink.